For the benefit of the uninitiated, a kiai (key'-eye) is the traditional "shout" one hears in the martial arts - but it is much more. In fact, there is no adequate translation for kiai without a brief discussion of its main component, ki. Ki, or its Chinese equivalent, chi, is correlated to breathing. Spirit has an etymology that has roots with breath, as in respiration. Ki, spirit, and breathing are deeply connected. So coordinating one's breathing with martial arts techniques is imperative to mastering them. The kiai works its magic during exhalation, and just prior to a strike; breathing out allows us to generate maximum power. An added benefit of kiai has the potential to startle the opponent, while invoking our own passion and kokoro (fighting spirit). An appropriate, well timed kiai should be used sparingly. It's important for a kiai to be as convincing as possible. In most traditional karate kata, two kiais make separate appearances, usually during a critical moment in the fight sequence. 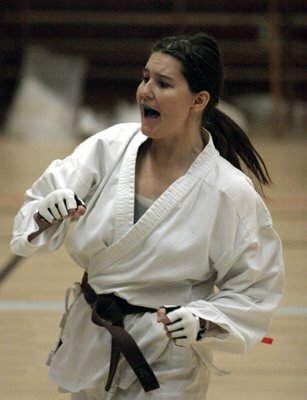 Since all kata start with a defensive move, the kiai represents an offensive conclusion delivered at the end of a series of techniques. There has been some misunderstanding of the real meaning of kiai; some regard it as unnecessary, or even phony. It's really up to the practitioner to give it significance, otherwise it just becomes a form of glorified yelling. For the dedicated budoka, the kiai symbolizes the manifestation of breath and technique, unified in an exultation of spirit. It does bring another question, the Kiai's place in kata. And in kumite. It's up to the practicionner to give it significance. There is definitely a place and time for appropriate ki-haps, as we call them in TKD too, that are worked into our forms as well. Even how the ki-haps are done are taught. They are supposed to be short and loud, not long and drawn out. But not a whimper either. At least something audible with a little enthusiasm! And speaking of chi, this is something that was spoken about at length when I went to a workout/seminar with Chief Master I.H. Lee about a month ago, and he's an 8th degree black belt. He said that you can be doing everything technically correct, but if your "chi" is off, everything you are doing is worthless. Even if you are still a color belt (like me) and you put your best effort and exude your chi, you do MUCH better in the long run. It was one of the few times that I actually felt like I was doing a better job than the high ranks because I knew I could exude that "chi" better. I understood what Chief Master was talking about, and he complimented me on it. It's a total package that you have to have, and in the end, the ki-haps, along with the chi, exude that total awareness and form of excellence. I've noticed most people don't kiai when sparring - or you get the guy who kiais with every other punch. I've never altered the kiai placements in any kata as it was originally shown, although I know of some instructors who have. Yes, there's nothing worse than a whimpering kiai/ki-hap. Supposedly, women can summon ki/chi easier than their male counterparts. Having good ki usually corresponds to a good lifestyle - both physical and psychological; it's a meeting ground between spirit and form. This discussion reminds me when I had the opportunity to watch two senior students spar using shinai. After a few initial contacts, they had squared off to each other, looking for openings. Suddenly, one student emitted the loudest kiai I had ever heard. The whole dojo seemed to shake. The other student (who had a lot of sword experience) calmly looked at his opponent, and said: "That does not work on me." And then tagged him with the shinai. Anyway, it's one of my favorite stories to share, so I could resist doing so here! Wow! I did not know that! Thank you. I always feel stupid doing them, but with knowing the meaning behind it, I won't feel so silly if no one else does it. I honestly thought it was for show, or as an intimidation tactic to throw off an attacker. As a side note, my daughter has a high pitched voice and when she kiai's it sounds like a high-pitched, "Hi" as in "Hi, how are you doing?" My husband always responds back, "Hi to you too" and she collapses in a fit of giggles. It's so funny. Thanks for this - we don't kiai in my style of Kung Fu and I've never really understood the purpose of 'wasting' your energy, or chi, in this way. This has really clarified what it's about for me. I've done some classes in some of the Japanese Martial Arts and it has always felt really odd to do this, mostly because I've been trained to breath through my nose and never my mouth! Ever since I have found my breath in kata, I have been amazed at how united our breathing out, and our technique are with each other. I find myself wondering how it would be possible to do a "silent" type of kiai. I've witnessed those quiet forceful Kiai exuded before.. they are almost like a growl than a yell.. but they have just as much force. Have you ever experienced that? The calmness you're referring to -- fudoshin, would be an effective antidote against an earth shaking kiai. Or it's possible the student "telegraphed" the kiai i.e. made its intent known before its delivery, which is why it didn't work. The practitioner's point of telling his opponent that his kiai failed was unto itself strategic. There is an element of intimidation in the kiai, but it's also meant to incite a feeling of power in the practitioner. Kids are cute. I'm glad your daughter is still doing karate. I know there are styles that don't advocate the use of kiai. Many Chinese systems are internal; their techniques are developed to blend. I suppose a kiai in Pa Kua or Hsing I would seem out of place. Kiais tend to be very external. I attended a jiu jitsu seminar several years back where the instructor demonstrated something like a "silent" kiai. Katas that incorporate dynamic tension type of audible breathing - like Sanchin, are also akin to what you're talking about. You're very welcome, Tangy Apple.